WALL STREET JOURNAL. April 3, 2016. Facing hard times at her family’s magazine company, publishing heiress Maria Rodale recently made a radical decision. 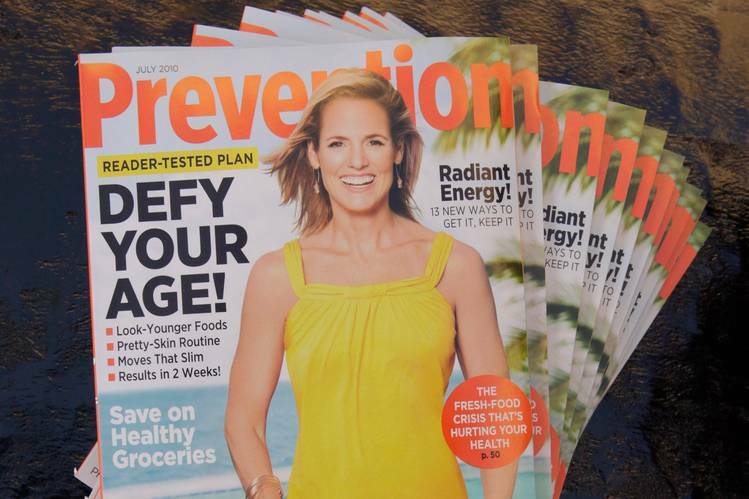 Prevention magazine, once Rodale Inc.’s flagship title, will no longer accept print advertising starting with its July issue. Prevention, which focuses on nutrition, fitness and weight loss, sold 707 ad pages in 2015—8.3% more than the prior year. But the revenue from those ads was less than in 2014, when the magazine had a much larger circulation and commanded a higher rate. Ms. Rodale, chief executive of the family-owned publisher, said the title has long been in the red. Following a steep drop in advertising across the company’s portfolio in the fourth quarter, and facing the company’s second annual loss in seven years, she decided to raise newsstand and subscription prices at Prevention and slash costs by eliminating pages with print ads. Some say the decision by the company, whose other big titles include Men’s Health and Runner’s World, makes little sense. “It’s hard to understand why one would give up the revenue from 700 pages of advertising,” said media industry consultant Peter Kreisky. Ms. Rodale, however, isn’t one for drawn-out debates. She says her ex-husband once called her a “woman of action,” not intending it as a compliment. She embraced the description as a tribute to her focus on getting things done. The newsstand price for Prevention, which made its debut in 1950, has immediately increased to $4.99 from $3.99, while annual subscriptions will double to $48 starting with the July issue. Ms. Rodale said she expects Prevention’s circulation to eventually stabilize at around 500,000 compared with today’s guaranteed circulation of 1.5 million. Printing one million fewer copies each month, together with reducing the size of the magazine to 96 editorial pages from about 140, including ads, will save money on production and raw materials. The magazine is also cutting 13 ad sales jobs, leaving three employees to handle ads on Prevention.com. The cutbacks will reduce Prevention’s operating expenses by more than 50%, Ms. Rodale said. Rodale isn’t the only company raising cover prices to compensate for a dwindling print advertising market. Most recently, the New Yorker magazine raised the cost of a bundled print and digital subscription by 43% in January. Magazine publishers used to be comfortable with low subscription prices because they brought in more readers, which, in turn, attracted more advertisers. But that equation is changing after years of print ad declines. “Publishers are trying to figure out the right price elasticity where they lose a few readers but make so much more money from a pure revenue standpoint,” said Rafi Mohammed, a pricing strategy consultant. As head of the third-generation publishing dynasty based in Emmaus, Pa., Ms. Rodale is navigating those challenges. She is also the mother of three and writes a country kitchen blog that advises readers she is “cooking up trouble, dishing out advice.” When informed that a former employee had described her as “a little subversive,” Ms. Rodale burst into a broad smile. Ms. Rodale has been at the helm since 2009 but she has been involved in key decisions since her father died in a car crash in September 1990, when she was 28. Robert Rodale left his four children equal shares in the business, but gave Maria Rodale all of the voting shares. Although Maria’s two older sisters and younger brother have seats on the board, Maria, a writer and self-described adventuress and explorer, has the final word. Her grandfather, J.I. Rodale, pioneered the organic foods movement in the U.S. The Rodales of Lehigh Valley, Pa., are lesser known than rival families that also own major magazine groups. In lower Manhattan, the Newhouses oversee Condé Nast, publisher of Vogue and the New Yorker. In midtown Manhattan, magazines owned by the Hearst family include Esquire and Town & Country. In the heartland, the Meredith heirs control the namesake publicly traded company that publishes Family Circle and Better Homes & Gardens. Rodale today is a much smaller version of its former self. The publishing company rang up sales between $300 million and $350 million in 2015, down from more than $600 million in 2008. During the same period, rival publisher Meredith Corp. saw revenue at its magazine group fall to $1.1 billion for the fiscal year ended June 2015, from $1.3 billion seven years earlier—a far less dramatic decrease. While both have been hit by the falloff in print advertising, Rodale’s decline was exacerbated by the closing of titles, declining single-copy sales and a shrinking direct book business. Meredith, on the other hand, acquired assets like Allrecipes.com and Shape magazine. Ms. Rodale said she’s concerned about the revenue drop but says the company isn’t considering a sale. At a time when many publishers are searching for nonadvertising revenue, Ms. Rodale points to the retail website she launched in 2013, www.rodales.com, whose offerings include natural fiber fashions, ceramic garlic keepers and large jam jars. “I think this is a business the next generation will really be excited about owning and want to get involved in,” she said. Web traffic at the unprofitable site has dropped sharply over the last two years to 84,000 in December, according to comScore Inc.Rodales.com revenue doubled in 2015, says the company. The Rodales, like many family business owners, are grappling with succession. In early February, they met to help ensure younger family members are involved in shaping the future of the company.